Catching a glimpse of how the rich and famous vacay during Spring Break in Southern California, avid traveller Sophie Chung paints a picture so sumptuously grandiose, you’ll be booking your next direct flight to L.A. as soon as you’ve saved half of your remunerated salary. Following a sleepless 11-hour economy red-eye flight across the Pacific Ocean, I finally arrived in the City of Angels, stars and unrealistic dreams. Greeted with a continuous stream of long honking where no one gives way and a blue sky that has yet to be infected with the SoCal summer smog, a large stupid grin spread across my face. ‘Ah yes. The glorious polluted aroma of a real city. What great luck that I won’t be suffering from any respiratory illnesses at this time of the year!’ I thought to myself. Ironically, the breathing problems kicked in soon after mingling with over a hundred thousand people at the Coachella music festival in the desert – tip of the day, don’t forget the mask. Fighting for an Uber in cyberworld with all the arrivals at LAX, grabbing a cab seemed to be a daunting yet somewhat gratifying feat. A mere eight mile drive to Santa Monica, I sank into a daydream of how I could truly utilize the convoluted highways jammed dead in traffic – wearing a bright yellow skater dress with a polka dot headband, I’d burst into “Another Day of Sun” in which 100 other drivers would join in a perfectly timed and choreographed jazz-dance number. I was perhaps a touch too inspired by the opening pre-credits sequence of my in-flight entertainment, La La Land – but then again, this is the city where people chase the unachievable American dream and what better way is there to celebrate one’s arrival than the art of animated song and dance? TIP: If you’re feeling fancy enough to don some sequins and Louboutin’s, ask the concierge for the latest trendy hotspots in WeHo and Downtown L.A. New bars and restaurants are popping up everyday so ask a local who’s got their party game down pat to avoid pricey tourist traps. Built in 1926 with a then inconceivable investment sum of two million dollars, Club Casa Del Mar was considered the grandest, high regency beach club in Los Angeles where Hollywood’s A-list silver screeners indulged in good ol’ fashioned law-breaking fun. A time when President Calvin Coolidge was adulated by many for his taxation policy, or more lack thereof, America’s economy was in full swing and everyone was lapping up luxury like there was no tomorrow. The West Coast was a fresh new hub of exclusive lavish beach clubs but Club Casa Del Mar on 1910 Ocean Way was the place to preen and be seen. In the grip of Prohibition, scandalous swinging parties, sunday-night operas, classical music concerts, grand balls, banquets and all other festive affairs were well oiled with top-notch hooch while free-flowing fortunes exchanged hands on the gambling tables and fed through the slot machines, an income that paid off better than Las Vegas. Having friendly relations with the right people, a practiced warning system to signal approaching policemen and thwarting publicity in the papers, Casa Del Mar operated successfully with a continuous stream of supplemental income from the hotel rooms and slot machines as the owners had no capital debt. 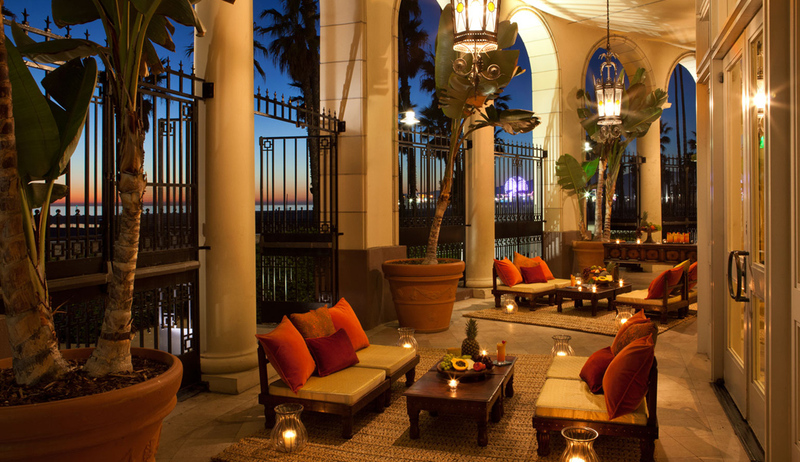 Holding Santa Monica’s fort as the haven of escapism, Casa Del Mar had its final flourishing stage during The Great Depression before hundreds of naval personnel took over the rooms and thousands of soldiers made the coast their home during World War II. 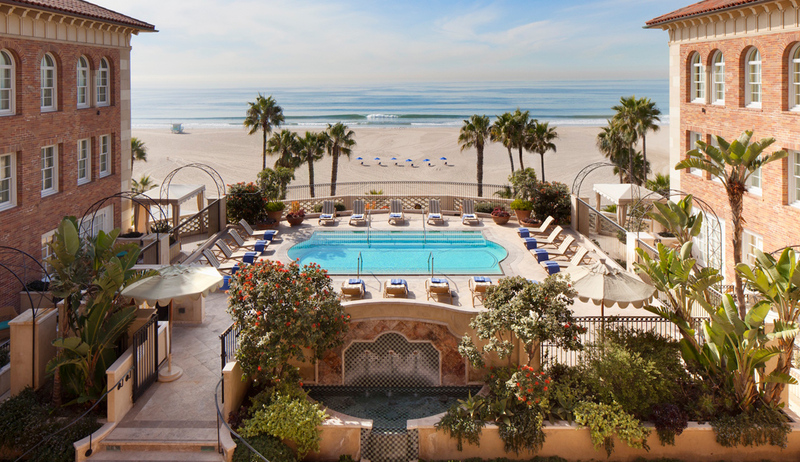 Rehabilitated in 1999 with a hefty $50 million renovation by the owners of Shutters on the Beach, Casa Del Mar’s name and reputation was restored as one of the most sophisticated and high-end properties serving SoCal’s most elite on the West Coast. The two sister hotels, tucked into a quiet cul-de-sac, are the only properties that serve a genuine oceanside villa stay with direct beach access in the entire L.A. area. 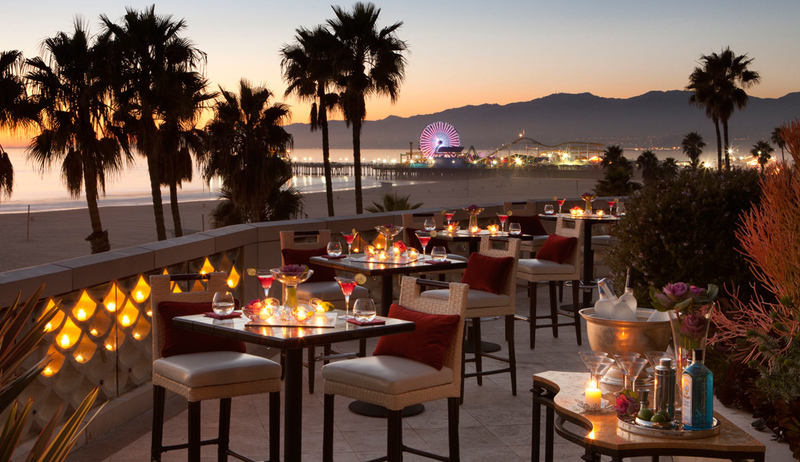 Despite its buzzing location in Santa Monica, these two hotels possess a distinct boutique resort-esque vibe that makes you feel like you’re on vacation away from the city. Offering 129 rooms and suites, most of them with unobstructed views of the Pacific and Santa Monica Pier, the owners sure as hell spared no expense in their interior decor. Carefully picked sea-themed books line the built-in bookcases and lavish lamps next to comfortable armchairs make it ever so easy to have a low-key night in. Shades of calming ocean-tones matched with muted neutrals adorn the walls and intricately carved furniture; and the rich walnut four-poster bed with patterned high-end John Robshaw linen create an upscale Mediterranean beach-house ambience that is fit for a Queen. So much so, that on my first night in the outrageously vast city that is Los Angeles, I stayed in the plush, high thread-count King bed with 2 bags of bright red, toxic Cheetos and Fritos and last but not least, a 6-pack of Lagunitas – happiness had never come to me at such a low price. It truly is the little things that count. TIP: Utilize the hotel’s Audi A8 hotel car to be dropped off at Santa Monica Place or anywhere within a 3-mile radius of Casa del Mar. The bathroom, no doubt, is the main highlight of the room with their insane cream of the crop fitout – never have I ever been in a room where the walls and floor are lined with Italian Calacatta marble – the light reflects off the marble in a way that makes one look super selfie-worthy, I ended up spending a lot of time just dancing naked in front of the mirror to Beyonce and Rihanna. Chuck in a jaw-droppingly gorgeous, deep hydrothermal massage tub with 42 jets into the mix, you’ll probably want to take the savings from your spa appointment cancellations and splurge on a bottle of Armand de Brignac a.k.a Ace of Spades to reenact Beyonce’s sassy pouring in that historic Nicki Minaj music video. Even the showers are designed in a way that makes you want to film a sensual, narcissistic music video – the bathroom’s peekaboo window that looks out to the beach via the room seems to make this creative idea plausible for production. After a long yarn to Tim, the ever-so-friendly gentleman at the concierge desk, I had compiled a handful of must-do’s that I needed to tick off while residing at Casa for three short but sweet days. First up, I needed to taste some fresh, Cali-inspired wellness food that the ridiculously good-looking cast of 90210 ate at brunch every episode. Looking hopelessly confused with my ultimate dork of a fold-out map, I couldn’t have made myself an easier target as I hunted down Santa Monica Place. After twenty minutes of passing through palm-tree adorned streets full of tall 5-star hotels and taking quick snaps of the symmetrical Deco Moderne styled City Hall, I finally arrived at the place that will host my first dining experience – True Food Kitchen. With all the hype and anticipation (or perhaps it was just pure hunger) that I accumulated during my walk, I had my suspicions – perhaps I had set myself up for disappointment? To my absolute delight, I was greeted by the friendliest, most patient waiter ever and I’ve yet to lower my expectations in hospitality service following this trip. Serving up the most unreal guacamole and ginger margarita made with fresh-pressed fruit and organic spirits, True Food Kitchen had made its mark as the restaurant to revisit for a splurge meal. Next up, shopping; an activity best done solo. Santa Monica Place is the home of high-end fashion with the best department stores like Bloomingdale’s, Barneys and Nordstrom; all spots that I resolutely avoided to ensure there would be enough dosh to last me my entire trip. Smoothly adjoining to Third Street Promenade, this place was my own shopping heaven – just three blocks of bright lights with all the clothes and shoes I’ve ever wanted, I managed to track down some sale items, my past afflictions of shopaholism slowly rising to the surface that would soon affect my common senses soon. After all, I returned first thing the next morning to just be there in the midst of it all. Feeling the need to venture out a bit further than Third Street promenade, I grabbed a rental bike from Shutters and let the 26-mile oceanside promenade take me away with the wind. Lined with palm trees, sand and an ocean view, it was an unforgettably surreal moment to bask in. The cool salty breeze mixed with the pungent aroma of dear Mary-Jane rushing through my hair and silk blouse is a goose-bump inducing sensation I can still recall. Cycling past crowds that are so starkly different to each other, Venice beach was the most unexpected amalgamation of people that I’ve ever seen in one area. Anyone with an urge to release their creativity seemed to conglomerate here. From vendors with boom mics reeling in tourists to show off a three-headed turtle to skaterboys doing tricks and flips that made my joints hurt by simply watching them, Venice Beach gave me a proper juicy slice of how the other side of the world lived and I loved every bit of it. A combination courtesy of booking.com. BOOK: A high-level ocean-facing room or suite to wake up to the waves and watch the spectacular sparkling sunset. For ultimate flexibility and freedom in updating or cancelling your bookings, use the booking.com travel app. For a pricey high-end accommodation option such as Casa Del Mar, it really makes a difference in your budgeting plans to be able to pay on arrival as opposed to coughing up your funds when you book months in advance. For any last-minute changes, booking.com also has a 24-hour cancellation policy so that no one is receiving the short end of the stick.